To keep it easy we’re using a pre-built chat-server from one of my articles – so on the one hand, there is a solution using vert.x from my article “Creating a Websocket Chat Application with Vert.x and Java” or on the other hand a solution based on Java EE 7 with an embedded GlassFish server from my tutorial “Creating a Chat Application using Java EE 7, Websockets and GlassFish 4“. *Update*: In between I have also written an implementation in Go: “Writing a Websocket Chat in Go“. Which one we chose does not matter as both variants allow us to start a full-blown websocket chat server with only Java and Maven as prerequisites. You may download the corresponding vertx-fat-jar or the war file from my repositories on Bitbucket here and there. The Java API for Websockets specifies not only the server- but also the client side API to handle a websocket connection. I found a nice tutorial, written by Jiji Sasidharan that explains the client implementation in detail here. The following dependencies are needed for the following examples. The important ones are javax.websocket-client-api for the API and the tyrus dependencies for the implementation. The two last dependencies are needed because the server implementation of our chat demands a specific JSON structure and we’re using the Java API for JSON Processing aka JSR 353 here to handle this. This is our client endpoint, marked as an endpoint by the javax.websocket.ClientEndpoint annotation. There are several lifecycle annotations that allow us to listen for specific states of our designated connection. Our implementation accepts a message handler for incoming messages. We’re now ready to use our endpoint by initiating a new endpoint with the chat server’s target URL. This code is used for both implementations – the console chat client as well as the GUI chat client. Let’s first start with the simple solution – a non-graphical console chat application. The application asks for our user name and the chat room’s name and initializes a connection to the chat server. Afterwards we’re able to type our messages in the console and read the response from the chat room. The two helper methods stringToJsonMessage and jsonMessageToString are needed to convert our in- and output into the format of the chat server. They are later used again for the graphical chat client. Now we’re ready for some more eye candy and that’s why we’re bringing JavaFX into play! Our graphical chat client consists of four parts: the application starter, the model, the controller and an externalized template in FXML markup. The model is our representation of specific states in our application and thanks to the powerful one-way or two-way binding capabilities of JavaFX it is really easy to bind properties and states of other components to this model. The model itself is a simple POJO, the interesting part is the observable API in JavaFX.. The controller is bound to elements from the FXML template, we’re referencing them using the @FXML annotation (references an element with fx:id). In addition, the controller binds different events, and model states to specific properties of our UI components. 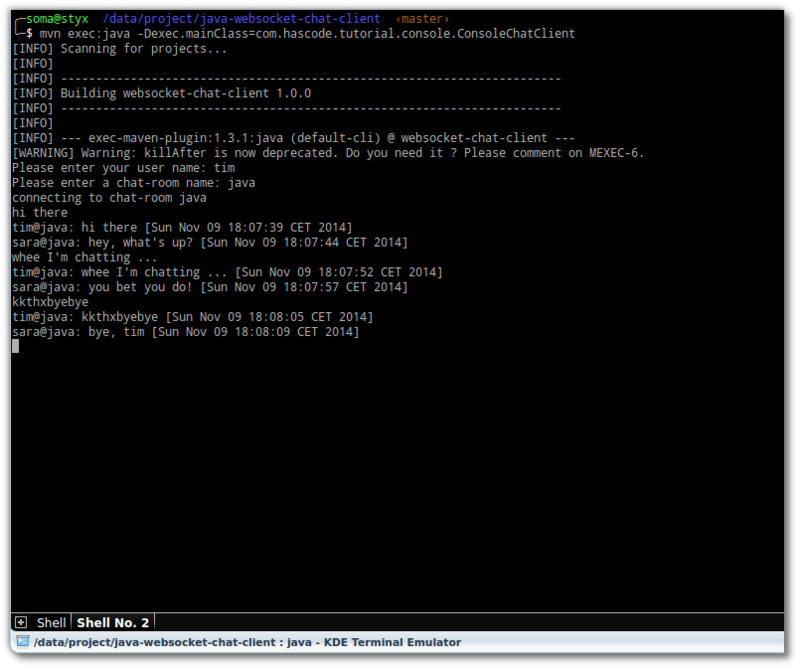 This is our externalized template named chat.fxml in src/main/resources/template. The template is bound to our controller via fx:controller attribute in the root element. 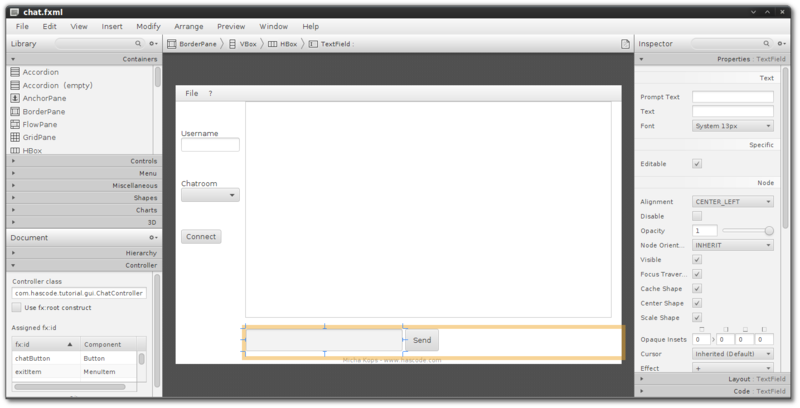 The Scene Builder allows us to compose our chat application layout with ease. Downloads can be found at the Oracle.com website here. This is the final part to start our JavaFX application. 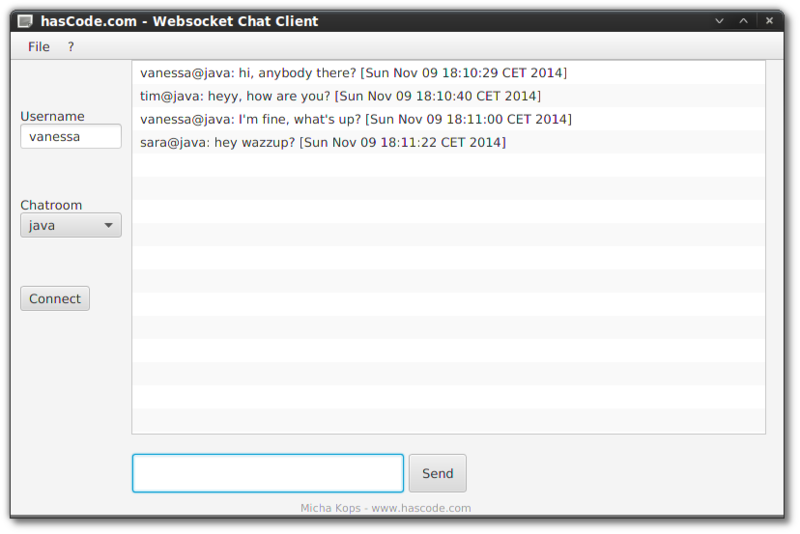 This is an example of an interaction of three chat users – one using a browser, the second using the console chat client and the last one using the graphical chat application. 2016-10-29: Typos fixed, link to Go implementation of websocket chat added. 2015-10-07: Direct downloads for the chat server either as Vertx fat-jar or as Java EE 7 war added. This entry was posted on Sunday, November 9th, 2014 at 8:01 pm	and is filed under Java, Web. You can follow any responses to this entry through the RSS 2.0 feed. You can skip to the end and leave a response. Pinging is currently not allowed. Thanks! Your Babbler project looks interesting, perhaps a good alternative to the smack library! Wow this is way too cool, but is too advanced for me, hope someday i can do and understand all this stuff. thanks for your feedback! I’ve just tested the console client app against my GlassFish websocket chat server and it works without a problem – might it be an issue with your setup or security configuration? Please keep me up to date if you’ve got news there! // Updated for JDK 7. Do you think this change for JDK 7 compatibily is okay ? That’s all. The console just waits there. I am not very keen to use the lambda expression in JDK 8.0 at this moment (since it is still not a stable release). That’s why I needed to change the code to make it JDK 7.0 compatible. Do you think the change/modification is okay (within the main method)? Hello my friend, thanks for sharing your experiences! I have a question for you, I am developing a javafx desktop application and I wanna install this on a computer and webstart it in another computer located in different room linked by local network, Is it possible accomplish this using only java websocket, or do I need to use tomcat/glassfish for that? sure, please feel free to download either the Vertx fat-jar or the Java EE 7 war file here and there. Please keep in mind that you need to deploy the war file on a Java EE 7 compatible application server (it won’t run on a simple Tomcat or Jetty servlet container).